The United States Coast Guard (USCG) is a difficult organization to define or label. It has no single mission, and its priorities change over the years. Looking at the Coast Guard’s 200-year history doesn’t simplify matters, but it does help to explain the Service, and it is an interesting way of viewing American history. Coast Guard men and women, and those who served in the five organizations from which the Coast Guard was derived, have contributed a lot to American history. They have fought America’s wars. They have battled pirates, privateers, slavers and smugglers. They have protected the environment, enforced laws and treaties and, of course, saved countless thousands of lives and more. This book, however, is a book about people and how they lived. It is about life on board early revenue cutters or in turn-of-the-century lighthouses. It is about fighting through a raging surf in order to save the doomed passengers and crew of a grounded ship. It is about the boredom of bouncing around on a cutter during a weather patrol, and the terror of gun battle during the Vietnam War. It is a history of men and women and even some children who have lived interesting lives and left their mark on the story of America. 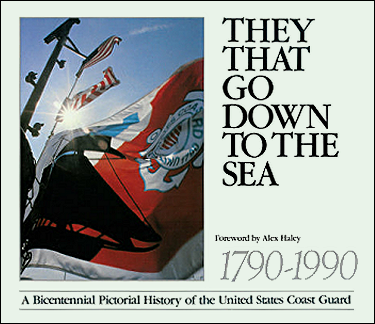 It is appropriate that the launching of this book should occur in 1990, the 200th anniversary of the U.S. Coast Guard’s founding. I am among the many Coast Guard retirees who are likely to comprise the book’s major market. Our careers have left us with a nostalgia for events which we each experienced in the oldest continuous sea-going service in the United States. As a writer, whose first writing efforts were made at night, usually at sea, on the mess tables of various Coast Guard cutters, I can remember stories I loved to write of the now legendary Coast Guard lighthouses, and of their gripping dramas. For instance, I remember writing about one middle-aged light-keeper couple who awakened to see an ice-laden four-master impaled on a reef during the night, and the only survivor washed ashore, lashed tightly within blankets in a basket—an unidentified infant girl, whom the state of Massachusetts let the light keeper-couple adopt. I used to love to sit around the real old-timer wearers of the shield, and hear their gripping personal tales of hair-raising Coast Guard responses and feats of rescue where ships of all sort have wrecked, foundered, caught fire, sprung serious leaks, or otherwise courted tragedy. Especially valiant in this area were the truly fearless personnel of the now-historic surf stations, whose rescue surfboats achieved life-saving miracles that made the surfmen, such as those at the famed Pea Island Station, literally legends in their own time. Even the classic lightships, those floating beacons of the sea, were vulnerable to being sideswiped by large passing ships. There was the tragedy which befell the TITANIC, which led to the U.S. Coast Guard’s perennial International Ice Patrol, conducted both by air and sea, so that no big berg lurks in any sea lanes unannounced. There have been many thousands of search and rescue missions, involving everything from small craft to huge cargo ships and passenger liners. No one can count how many sea miles have been sailed by Coast Guard cutters on their grids on boring ocean patrol, away out there, in readiness for whatever might occur—as when a major airliner laden with passengers had to ditch into the Atlantic, on Ocean Station Charlie, and the patrolling Coast Guard cutter BIBB, revved up to flank speed, was quickly there, saving air passengers. The world sighed in relief, and everybody in the Coast Guard walked a little taller. I could go on and on, but that would be to ignore the present-day achievements of the Coast Guard, about which I am far less able to speak authoritatively. For me, nothing more graphically illustrates some of the new, modern Coast Guard’s frequent bewilderments for us old-timers than how the names of ratings have been changed. Recently I was in Milwaukee, to speak at an anniversary ball, when I mentioned that I’d been a Coast Guard cook. I was told that a cook nowadays is termed a “subsistence specialist,” for Pete’s sake! I couldn’t help remarking how that sounds to me like someone trying to cook with test tubes instead of pots and pans, as we used to. Make no mistake, the modern U.S. Coast Guard is awesome. I’m very much perplexed about how I, long retired, can do justice to describing, even identifying, the vast range of Coast Guard functions performed today. I’ll simply say that we’d have to live in some other country not to be aware of the Coast Guard’s roles in drug interdiction, in countering ocean oil spills, in marine ecology, and in ongoing search and rescue, not to mention scores of other activities, which require the maximum capacities of the men and women of today’s Coast Guard, whom all of us old-timers proudly salute with . . .